Fraud losses on UK-issued cards totalled £671.4 million in 2018, a 19% increase from £565.4 million in 2017. At the same time, total spending on all debit and credit cards reached £800 billion in 2018, with 20.4 billion transactions made during the year. 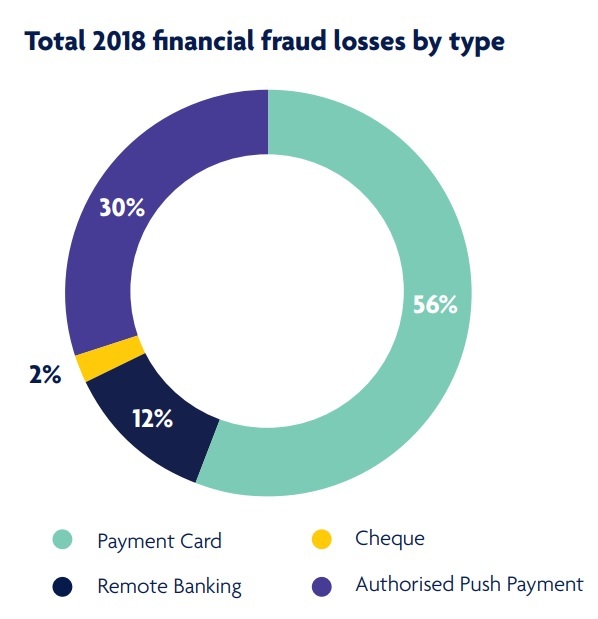 Unauthorised financial fraud losses across payment cards, remote banking and cheques totalled £844.8 million in 2018, an increase of 16 per cent compared to 2017. Banks and card companies prevented £1.66 billion in unauthorised fraud in 2018. This represents incidents that were detected and prevented by firms and is equivalent to £2 in every £3 of attempted fraud being stopped. In addition to this, in 2018 UK Finance members reported 84,624 incidents of authorised push payment scams with gross losses of £354.3 million. 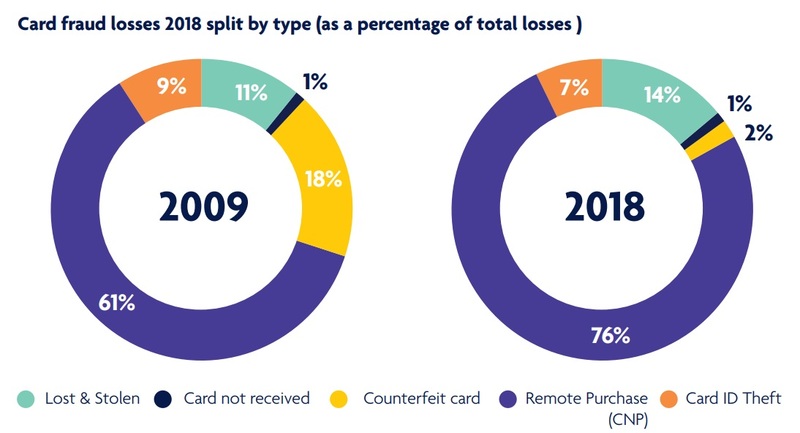 Overall card fraud losses as a proportion of the amount we spend on our cards increased during 2018, rising from 7p per £100 spent in 2017 to 8.4p per £100 in 2018 (in 2008 it was 12.4p for every £100 spent). A total of £1.12 billion in card fraud was stopped by banks and card companies in 2018, a rise of 14% on 2017. This is equivalent to £6.27 in every £10 of attempted card fraud being prevented. These figures cover fraud on debit, credit, charge and ATM only cards issued in the UK. Payment card fraud losses are organised into five categories: remote purchase (card not present or CNP), counterfeit, lost and stolen, card not received and card ID theft. Victims of unauthorised payment card fraud are legally protected against losses. Industry analysis indicates that banks and card companies refund customers in over 98% of cases. Overall remote purchase fraud increased to £506.4 million in 2018; a rise of 24% when compared to 2017. Online fraud against UK retailers totalled an estimated £265.1 million in 2018, a rise of 29% on the previous year. Mail and telephone order (MOTO) fraud against retailers based in the UK also increased, rising 14 per cent to £92.1 million. While the number of cases of remote purchase fraud increased by 47 per cent in 2018, the gross loss rose by the lower level of 24%, suggesting that card issuers are identifying and stopping individual incidents more quickly. During the same period there was a 24% increase in genuine remote purchase transactions, totalling 5.9 billion in 2018, with a 14% increase in value to £387.1 billion. This means that as a proportion of spending, remote purchase fraud is 13p in every £100 spent, up from 12p in 2017. Losses due to lost and stolen fraud rose by 2% in 2018 to £95.1 million. The number of incidents increased by 24% during the same period, resulting in a lower average loss per individual case. This reflects that bank systems are detecting fraudulent spending more quickly, combined with the £30 limit on individual contactless transactions. Each contactless card also has an inbuilt security feature, which means from time to time cardholders making a contactless transaction will be asked to enter their PIN to prove they are in possession of their card. The frequency of this will vary between card issuers. From September 2019, new rules (the EU’s second Payment Services Directive (PSD2)) will require a PIN once a customer’s total contactless payments exceed a cumulative value of roughly £130 (€150) or when five contactless payments have been made.